édité le 15/06/2018 - Plus de news de "BAKER HUGHES" - Voir la fiche entreprise de "BAKER HUGHES"
Baker Hughes, a GE company will supply turbomachinery equipment for the expansion of Cheniere’s LNG facility in Corpus Christi, Texas. Cheniere announced a positive Final Investment Decision (FID) and the plan to issue a full notice to proceed to continue construction on the third liquefaction train at Cheniere’s Corpus Christi liquefaction project (CCL Project). According to the company, this represents the first FID on new liquefaction capacity in the United States since 2015. When all three trains are completed, the aggregate nominal production capacity of the CCL Project is expected to be approximately 13.5 MTPA of LNG. 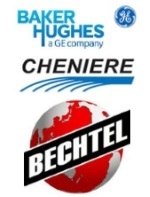 Cheniere appointed Bechtel as their Engineering, Procurement and Construction (EPC) partner for the project, and Bechtel Oil, Gas & Chemicals, Inc. (Bechtel) contracted BHGE to provide turbomachinery equipment for the third train consisting of six PGT25+G4 DLE gas turbines driving various compressors. BHGE has provided the same equipment for two other trains already under construction at Corpus Christi, and similar technology for five trains at Cheniere’s Sabine Pass plant. This agreement expands BHGE’s global footprint by bringing engineering, manufacturing and project management from Evendale, Ohio; Houston, Texas and Florence, Italy.